Black Arrow's Gypsy leather jacket takes the classic perfecto style and turns it up a notch. It is made from beautifully supple, pebbled texture leather with a thickness of 1.2-1.5mm throughout. Most manufacturers stop there, but not Black Arrow: the Gypsy has DuPont™ Kevlar® panels backing up the leather in critical areas, for optimum abrasion resistance. The jacket comes equipped with a full set of CE-rated level 1 armour in the shoulders, elbows and back to protect you from impact. It's got the looks, it's got the protection, but it scores high in the comfort department too: The back is gusseted to allow for unimpeded mobility when reaching for the bars, and the arms have ribbed stretch panels above the elbows for when you're tucked in on the tank. The slightly elongated back avoids any unwanted exposure. Zipped vents are hidden in the back gussets to allow for airflow. The women behind Black Arrow know what they're doing when it comes to designing a ladies jacket, and the Gypsy will prove comfortable straight out of the box. Double adjustment belts on either side of the waist allow for the jacket to be tailored to your preference. A classic look, finetuned by Black Arrow. Sizing for the Black Arrow Gypsy Jacket as verified by the Urban Rider team. 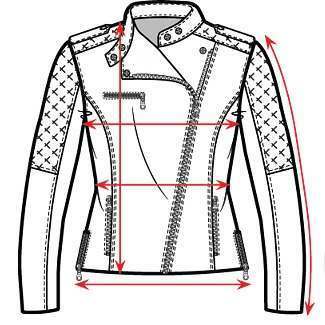 Take your favourite jacket, lay it flat and compare it to our measurements of the Black Arrow Gypsy Jacket Jacket below.